We helped Bay Path College reintroduce itself to the world as Bay Path University. We first began working with Bay Path in 2011. At that point in time, the University was still a College and they wanted help telling their distinctive story. Circles of Influence, internal focus groups with a variety of audiences, external focus groups, the review of a recent alumni study and a Coherence Inventory helped us uncover some key findings. 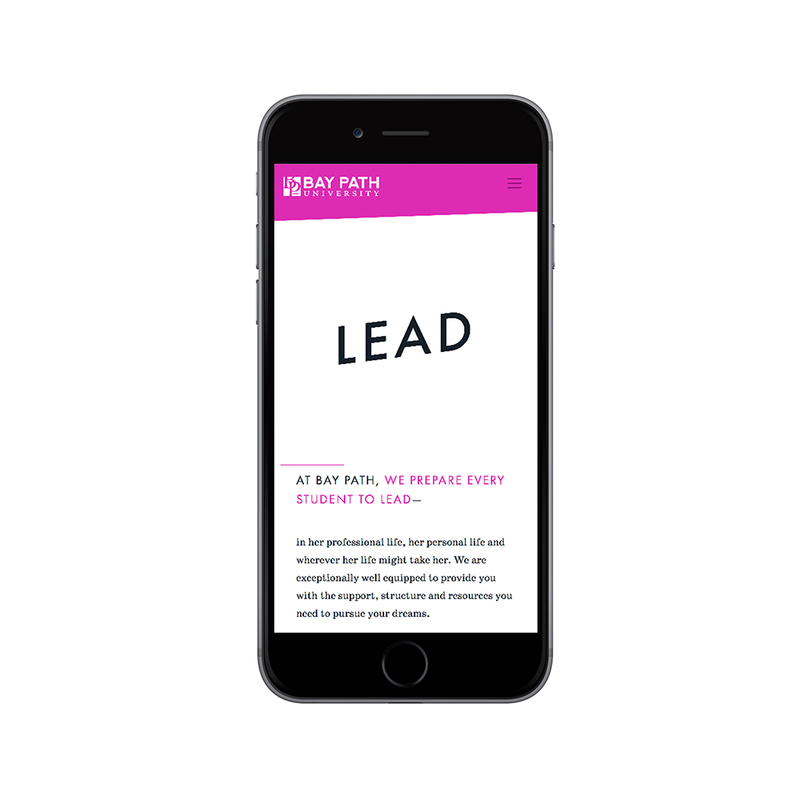 Bay Path wasn’t articulating a clear brand message; they were battling perceptions built on their “secretarial school” past; they weren’t keeping critical audiences on track with their progress and they suffered from a general lack of awareness in the marketplace. We also discovered a culturally and geographically diverse community that celebrated difference; a community devoted to serving first-generation students; a community with a strong entrepreneurial spirit that was incredibly responsive to consumer needs. There was a clear, compelling and important story to tell about Bay Path that needed to reach the right audiences. We got to work telling it. We developed campaign language that reflected the vitality and vibrancy of the Bay Path community. 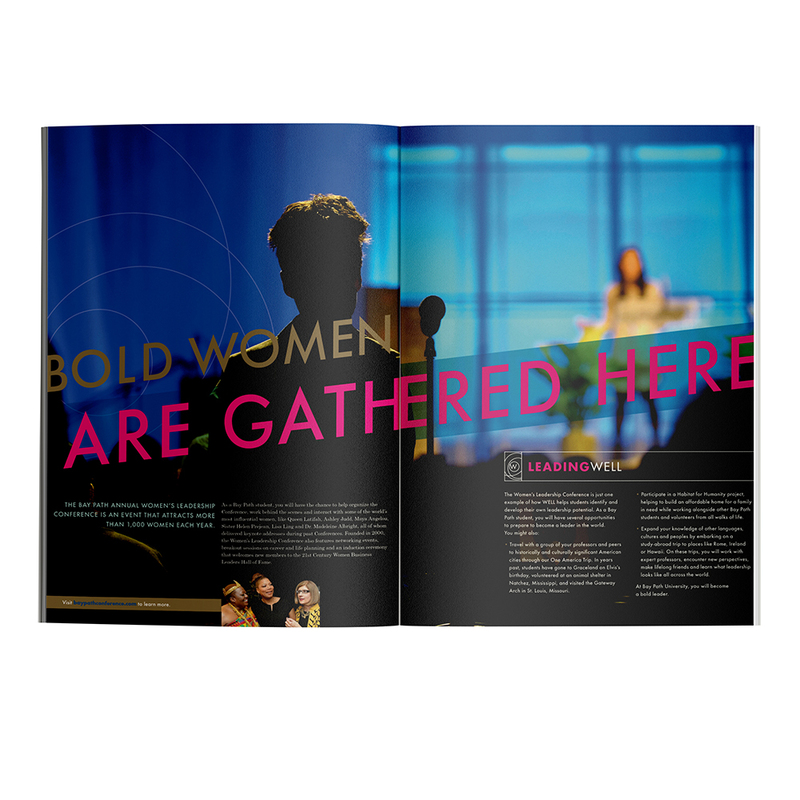 “The New American Women’s College” and “Bring your ponytail” were used throughout the communications pieces we created, including a viewbook with a beautifully refreshed color palette and an accompanying microsite. This theme language, which underscored the entrepreneurial and hardworking spirit of the campus, was also used to contextualize profiles of current students, faculty and alumni who reflected the best of what Bay Path has to offer. Once created, we worked closely with the internal marketing team and campus leadership to ensure that these materials were reaching the right prospects and being translated effectively to on-campus audiences. The result of this work was renewed internal pride, a greater focus on consistent and accurate messaging and a dramatically elevated academic profile for incoming students, as demonstrated by a 91% increase overall in their test scores, class rankings and GPAs. Building on the success of this campaign, Bay Path decided to implement a new curriculum called WELL that emphasizes holistic, integrated learning experiences designed to help students thrive in their personal and professional lives. While they named and created WELL on their own, they were struggling with how to best communicate its advantages to future students. We were invited back to campus to conduct another round of Circles of Influence so that we could learn more about the program and help brand this important work. We were impressed by the level of engagement, ambition and hard work demonstrated by the students we encountered. Three of the six pivotal students who helped convene this round of Circles invited their mothers to participate, and from each of them we heard story after story about how Bay Path had helped their daughters grow in tangible and unexpected ways, each independently concluding that their confidence and sense of self had improved dramatically as a result of their time at the school. During the same time that WELL was being developed and implemented, Bay Path was making the transition from a college to a university. To communicate all of these changes to the next generation of students, we developed a suite of new communication materials, including travel cards, a viewbook and a microsite. 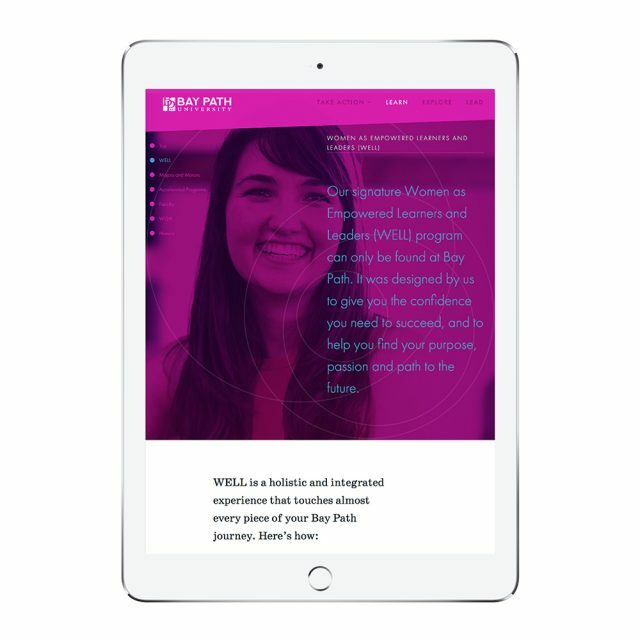 In each, we emphasized Bay Path University’s skill at preparing students for the real world and presented WELL in a streamlined, accessible way that highlighted its holistic nature. We designed a beautiful new logo for the program and used it to identify sub-brands of the experience that we addressed alongside complementary Bay Path experiences. For example, WELL’s leadership component, which we named Leading WELL, appears on the same viewbook spread as does their Women’s Leadership Conference.